ONE OF THE ELECTRICAL FOUNTAINS - On each side of the MacMonnies Fountain, which was the principal decoration of the Fair, was placed a circular basin or inclosure, as seen in the photograph, from which many volcano-like craters issued. These were covered with rustic rock-work for ornament in the day-time, when the fountains were not in use. At night, there issued from these craters streams of water lava - green, golden, rosy red, pink, yellow and blue - the columns rising to a much greater height than may be here seen, capable also of multiple colors, cross-playing, and pyramidal effects. The vari-colored night fountain, in former times, was produced only on the dramatic stage, the colored lights being thrown upon the waters from the flies and by the Drummond light. 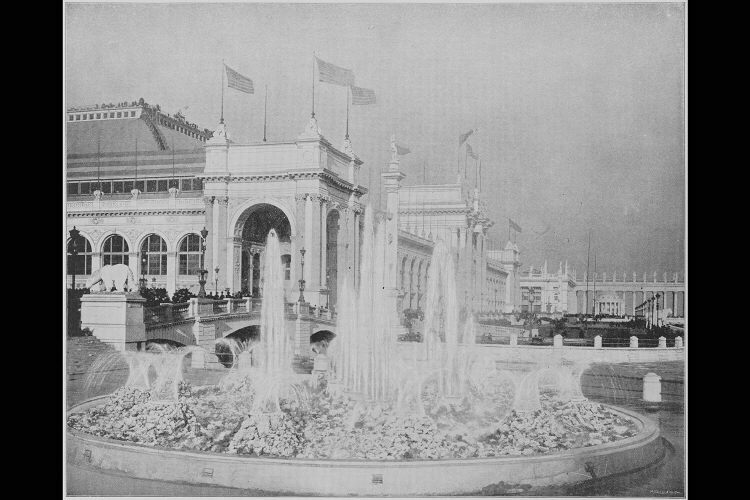 The electric fountain was introduced to the general public at Paris, in the Exposition of 1889, with great success. Mr. Yerkes, of Chicago, then erected a fine example of this beautiful device at Lincoln Park, in the northern part of the city of Chicago, which, playing on three nights a week, was visited by millions of people. These fountains at the Fair, at the hours in which they were played, added distinctly to the bewildering beauties of the scene. The operators are concealed in a spacious room beneath the basin, and electric lights play on the water before it rises out of the funnels. Owing to the complexity of the apparatus - hydraulics, dynamos, and what not - disappointment is frequent and unavoidable, but the successful exhibitions are all the more highly enjoyed by the people.